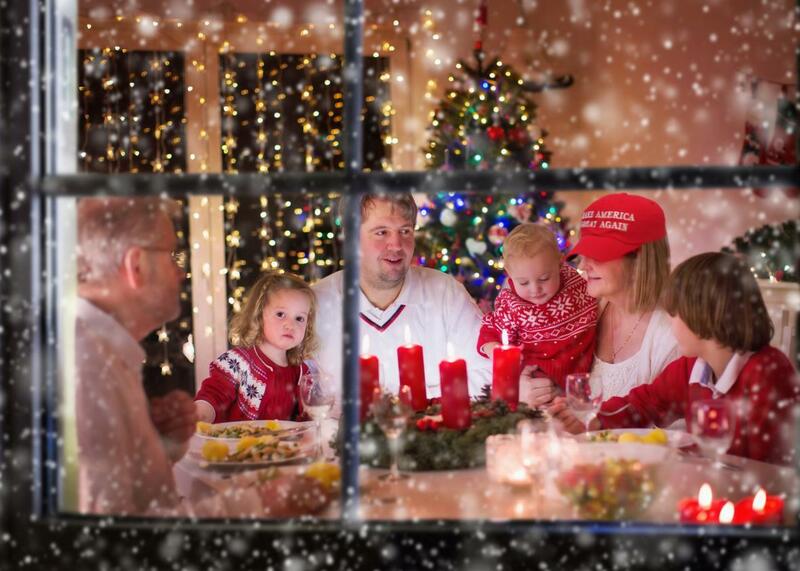 Is it bad parenting to get into political arguments over the holidays? Will I Set a Bad Example for My Kids if I Argue With Trump-Supporting Relatives? Photo illustration by Slate. Photo by FamVeld/Thinkstock. It’s a paradox, really: When the results of elections mattered less, it wasn’t so hard to avoid talking politics at family holiday gatherings. Now, though, this kind of self-imposed muzzling seems like an act of civic irresponsibility. On the other hand, any conversation that contains the proper noun Trump can quickly descend into post-apocalyptic terrain, to no one’s benefit. It’s hard to know what to do—but I’m not sure keeping my kids safe in the helicopter surveying the scorched earth below is the best policy. This Thanksgiving was an early example of what we’re in for. Per tradition, we spent the day with my family. Normally, I’d be able to have a restrained discussion about a recent presidential election—or not, as the occasion and circumstances dictated. As it turns out, the consequences of, say, electing Mitt Romney would have been bearable. (We could little imagine the depths to which we’d sink.) So mostly I kept mum, unless some ill-informed statement was lobbed my way, in which case I’d unleash a stream of know-it-all verbiage. It was all within the bounds of civility, and anyway, until recently the kids were too young to know what was going on. I think my instinct to flee was right—or at least defensible. But I was torn. I didn’t want to stay, because I have only a selvage of space for dealing with the dismal political situation we’re in, and I worry about my reactions when dealing with family. If my pointedly useless Facebook rantings are any indication, I might detonate—not exactly the best parenting showcase. Yet it’s important for the kids to understand what’s going on to the extent they find they’re ready for it. I’m not surprised that one stayed and learned about how to do (and not to do) this kind of thing, because she’s more serious and argumentative than the other, who’d rather gather shells on the beach. Do I worry that my kids will say or do things that might be disrespectful to adult family members? Yes, a little. Although they’re predictably less than unfailingly civil to their two dads—I did mention that they’re 12, right?—they’ve been reminded of the importance of respect and even deference to others, especially “grown-ups.” As far as I can tell, they generally behave well. But what if adults say things that aren’t grown-up? And here’s where my own view of Trump voters causes problems. At the base of every such vote is a profound incivility and disrespect. No matter the economic justifications offered, no matter the understandable exhaustion of business-as-usual-politics in Washington (exemplified, to them, by Hillary Clinton). In the end there’s just no escaping that, at bottom, pulling the lever for Trump meant you were OK with the constellation of deeply disturbing values spewed forth during the campaign. As Ezra Klein memorably stated, the election was not a test of Trump’s decency “but of our own.” Trump flunked that test long before Nov. 8; we failed on Election Day. So how am I supposed to forget all that, or encourage my kids to treat this as any other election? Is “the show of smooth civility” always the best response? And what am I going to do about the socks? This year, we are going to spend Christmas with David’s family in the Niagara Falls, New York, area. He has a large and voluble extended family. But some of them, I am more than guessing, voted for a guy who, just for instance, should have been shunned for mocking a person with a disability. I’m debating whether to totally ruin a hallowed holiday tradition to make my anti-Trump feelings known. Every year, one of the many cousins and her (very conservative) husband host a Christmas Eve party where the highlight event is the gift exchange. This year, they’re changing it up: Everyone brings a pair of socks. (Yes, socks.) They can be stuffed with any type of “gift,” and no one knows what each pair contains until the big reveal at the conclusion. So far, my ideas run the gamut from anti-Trump buttons all the way to anti-Trump kitchen magnets. I might even be able to get away with this passive-aggressive stunt in the context of the gift exchange, because the idea, see, is to be funny and maybe even a bit risky/risqué. (People have even gotten away with mocking the Trinity and the Virgin Mary, even though it’s a largely Catholic crowd. And my kids won’t even have to squirm, because the event is for adults only. But of course, as a parent, the question is always: How would I feel if my kids found out I’d done this? Would they regard my action as within the acceptable bounds of good-natured humor, or as some irretrievable breach of etiquette? What are the rules in this new, terrible age we’re in? I wish I knew, but there’s wisdom in taking a breath—and collecting shells.